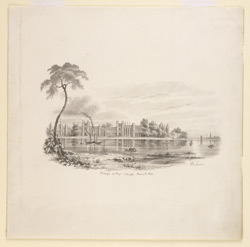 Wash drawing of Bishop's College in Calcutta by Henry Carre Tucker (1812-1875) dated 1833. Inscribed 'Bishop's College, Calcutta. March 12 1833. W.C. Tucker'. Bishop's College was established in the early 1820s at Sibpur by the first Bishop of Calcutta, Thomas Middleton, as part of a scheme for a theological college along the lines of that at Cambridge. It contained a chapel, houses, library and lecture rooms.